In the summer of 2009, I was going on my first geology field trip soon and I knew I needed an Adventure Hat. The problem was, for whatever reason, it was difficult for me to find a hat that fit my head perfectly. I remember one time I was trying on a hat and it didn’t fit me quite right, looking at the tag, I read “One size fits most.” But after much looking around, I found one and it has been by my head ever since. 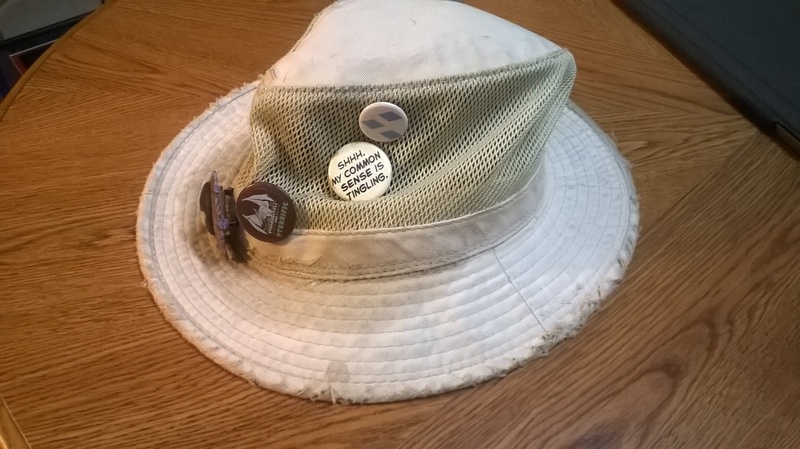 I have been with this hat longer than I have known my girlfriend, many of my current comrades, and all of my nieces and nephews. It has been with me so long that many of my peers and acquaintances recognize me from a distance solely based on me wearing this sucker. It has traveled with me from cities to the middle of nowhere, through rainstorms and snow, through deserts and forests, and glared by the blazing sun and splashed by a beach’s salty waves. It has traveled to Istanbul, DC, Paris, San Diego, and even the little town of Drumheller, Alberta. Pins adorn the hat to the point that some may call tacky or compare it to a car’s bumper overfilled with stickers but I don’t care. They are pins that describe me, or are part of my identity, or I just find interesting. The constant exposure to the elements has made their needles rusted over time but they hold firm to the Hat. I can’t tell you how many times I have lost my Adventure Hat. Sometimes, I may simply have misplaced it, but other times, it will be gone for weeks at a time. One time, I was over at a friend’s house, I was sitting on her couch and I took off my Hat and set it on top of the couch. The Hat slid off and fell behind, trapped in the shadows of the netherworld. I then left her place and forgot about it (I do that a lot unfortunately). It wasn’t until I came back almost a month later that I found it again. All of its adventures have taken a notable toll on this hat. Its edges are frayed, the color has faded, a sweat stain spreads slowly on the brim, and holes form previous pins are scattered throughout its exterior. And yet, I still wear it because it does its job right. If my soul gets separated from my body for whatever reason and you need a material object to bring it back, PLEASE USE MY HAT! I can’t emphasize that enough. It will make your life sooooo much easier if you use my hat (provided I hadn’t lost it again). Also, if I’m possessed by some raging demon from the fifth dimension and I’m shouting how bad you smell, use the Hat. I swear, I bet this hat is filled with some sort of luck charm or whatever based on how many times I have lost and found it. I wouldn’t be surprised if a part of my soul is even in the Hat itself. If I had a horcrux, it would be the Hat. No shocker there. The best part is that if I died, all I need is somebody to take the hat and wear it temporarily. My soul could then slowly take over there body! Soon they’ll be wearing socks with sandals, sing Gilbert and Sullivan, and write pointless blog articles on the internet! The problem with that is no one would wear such a tattered thing! You might as well just bury it with my body for all the good it will do. This Hat means a lot to me and I still find it useful to this day. I’m looking forward to taking it with me to Fossil Butte National Monument where I’ll be a park intern this summer. It’s going to be so awesome wearing my park uniform with my Hat! My Hat has been with me for many years, and I hope it will keep on, keeping on for more years to come. This entry was posted in Uncategorized and tagged Adventure Hat on May 25, 2015 by Andy.